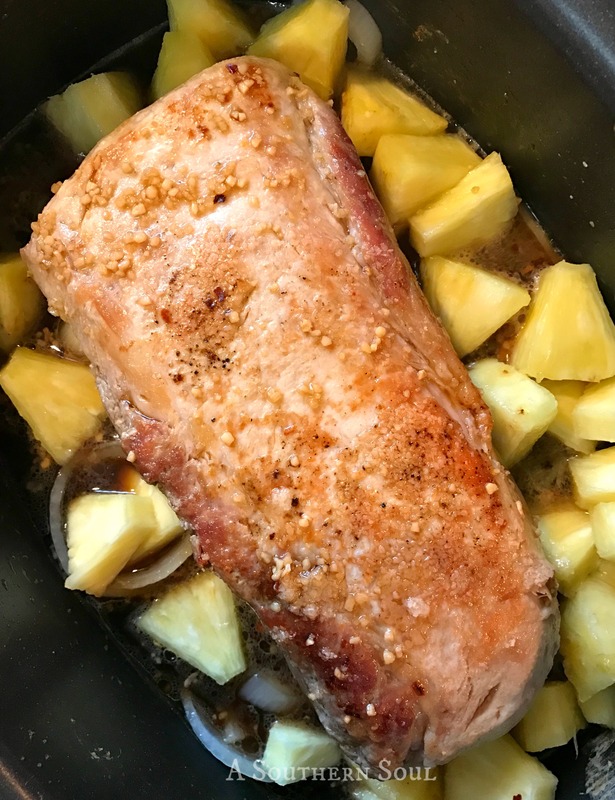 This pork roast that is a little sweet along with a bright burst of flavor from apple cider vinegar and fresh pineapple. 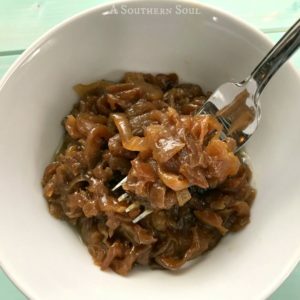 There is very little cooking involved because once you sear the pork and caramelize the onions, all you do is add in the remaining ingredients and let the slow cooker do all the work. It’s perfect for a weeknight, family meal or when entertaining special guests! Sometimes, you just want to hang out at home, watching your favorite show wrapped in soft throw and let the world spin on by. Those times also brings on the urge to eat yummy comfort food. 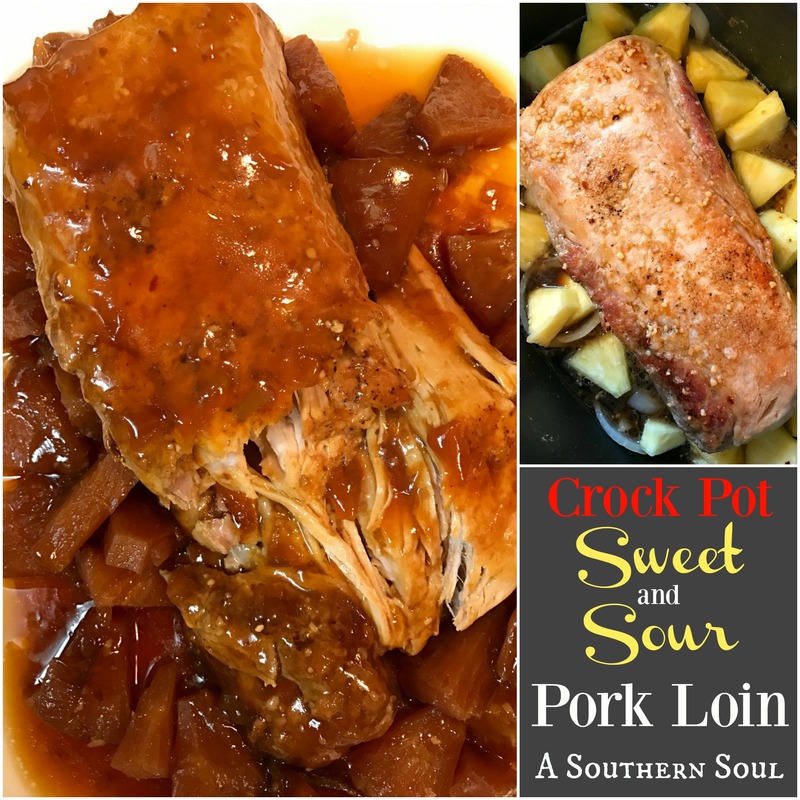 There’s almost nothing as comforting as a home cooked meal and when you can make something delicious with very little effort, like this crock pot sweet & sour pork loin with pineapple, well, I’m all in.This new, satisfying dish that I recently came up with, is a recipe for a pork roast that is a little sweet along with a bright burst of flavor from apple cider vinegar and fresh pineapple. 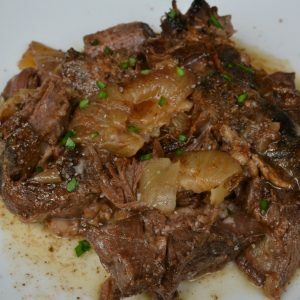 There is very little cooking involved because once you sear the pork and caramelize the onions, all you do is add in the remaining ingredients and let the slow cooker do all the work. After several hours in the slow cooker, your simple cut of meat has turned into something incredible. The meat is absolutely mouth-watering and fork tender. I took one last step and thickened up the drippings into a luscious gravy. Oh my…this is some kind of comforting goodness. I served my new creation with herbed brown rice and roasted veggies. 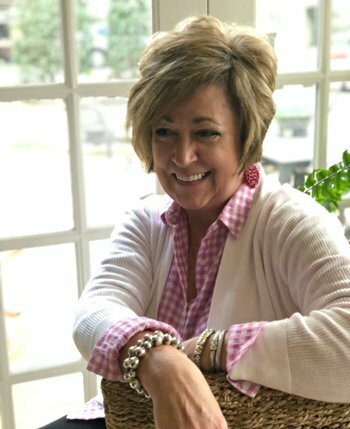 I knew I’d done something special when the lively dinner conversation kept going even while my boys got up from the table to serve themselves a second helping. So, let’s go ahead and embrace lazy days with easy, heartwarming dishes and that bring a little happiness to family and friends. Ahhh…contentment. 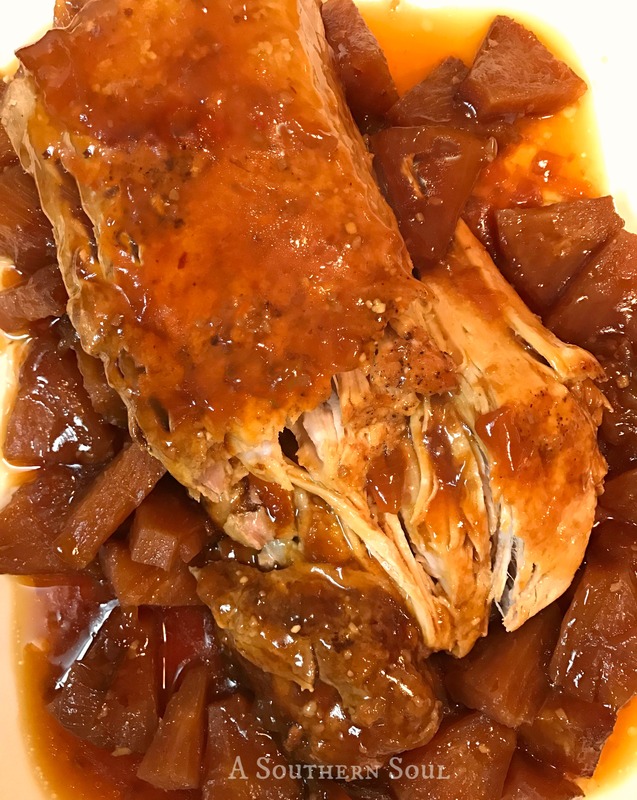 Tender pork loin cooked low and slow that's packed with sweet & sour flavors. Heat olive oil in a cast iron or heavy bottom skillet. Salt and pepper all sides of pork roast and sear in skillet. 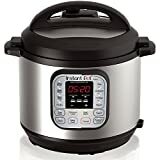 Remove and place in crock pot. Sear onions in hot pan until slightly browned. Place onions in crock pot with pork loin. In a medium size bowl, mix apple cider, soy sauce, honey, brown sugar, garlic, salt and red pepper. Pour over roast. Place pineapple chunks around pork and cover with lid. Cook on HIGH for 5 hours or LOW for 7. When done, remove pork and pineapple from slow cooker and place on serving platter. Turn slow cooker on high, add cornstarch slurry and stir to mix well. As mixture starts to bubble, keep stirring until desired thickness is achieved. 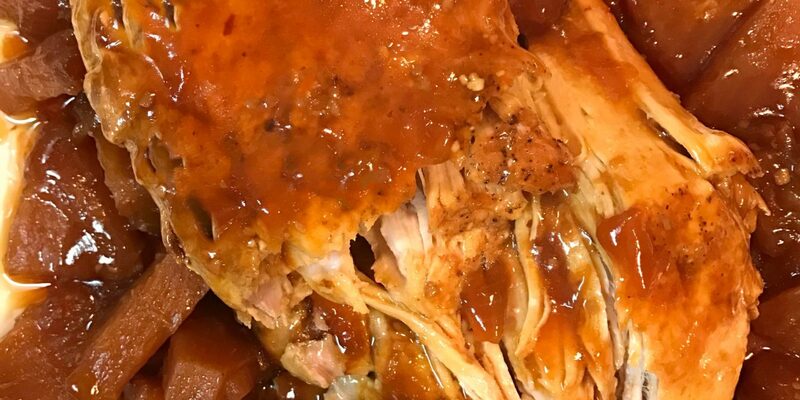 Spoon gravy over pork loin. Serve! 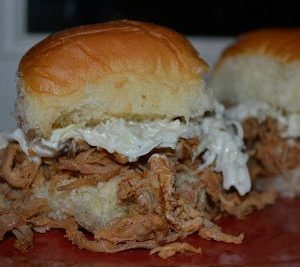 Find this recipe and more at WHATCHA CROCKIN? PreviousRecipes & Special Memories | Happy 2017! Thanks so much for stopping by and linking this recipe to First Monday Favorites. I love the combo of pork and pineapple, they just seem to complement each other so well. Hope you’ll come by next month as well. I’m on FB as Sid’s Sea Palm Cooking, with First Monday Favorites as a group on there as well. Thanks! Hope you enjoy the recipe. 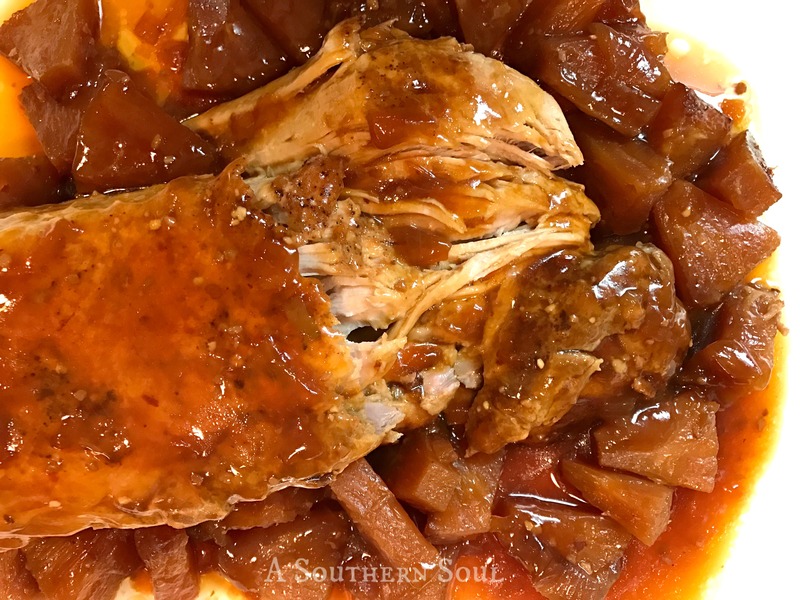 I love cooking pork in the slow cooker and that pineapple makes this lovely. Thanks for stopping by Lauren! Hope you enjoy the recipe. Do I really have to sear the pork loin? I don’t have a cast iron or heavy bottom skillet. Hey Angel! Good question. First, you don’t have to sear it but it does give a richer flavor to the meat. Second, you can use any skillet you have to sear the meat, I’m just partial to cast iron. Thanks so much for stopping by. Let me know how the recipe turns out! my mother-in-law gave me a crockpot as early christmas gift and now i am enjoying it with this brilliant and sumptuous recipe! easy and yummy! Well, Merry Christmas, Ella. 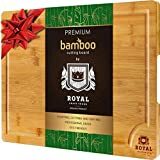 What a great gift and I am honored that you chose one of my recipes to use with your new gift! I hope you enjoy your crock pot and this recipe for years to come. Sounds delicious, but the 1 cup of vinegar seems like a lot. Is this a typo or is it really 1 cup? Nope, it’s not a typo! It’s delicious and tenderizes the pork. If you’ve never cooked with vinegar, it’s a great ingredient that actually turns sweeter and gives a bright flavor to meats. Hope you like it! Thanks, I’m going to make it on Sunday, I”m looking forward to trying it. I have this going right now and totally forgot to add the pineapple. I thought it was smelling too “vinegary”. I decided that the pineapple wouldn’t have that slow cooked by dinner time so I just add a little more brown sugar in hopes to cut the acidity. I hope it works. It smells and looks amazing!!! Oh no but I like your idea of the brown sugar! Good call. If you have the pineapple, you might try sauteing it in a bit of the sauce to make it tender and then serve it over the pork. Just an idea. Let me know how things turn out. Sounds delicious! I look forward to fixing this. Mmmm! I already know I am going to love this. It is really speaking to my taste buds. I need to get it on our menu ASAP! What a fun way to celebrate national pork month! Can I use pineapple juice for this recipe instead of fresh pineapples? Give it a try, Mary! I must have done something wrong, all I can taste and smell is the apple cider vinegar. I followed everything to the T I thought, any suggestions to what may have gone wrong. Sorry for the delay, Matthew. I am trying to think what could be wrong. I’ve made this recipes countless times so I’m surprised at the outcome. Maybe the pineapple was not ripe enough? That’s the only thing I can think of. I hope you’ll try it again and let me know what happens.